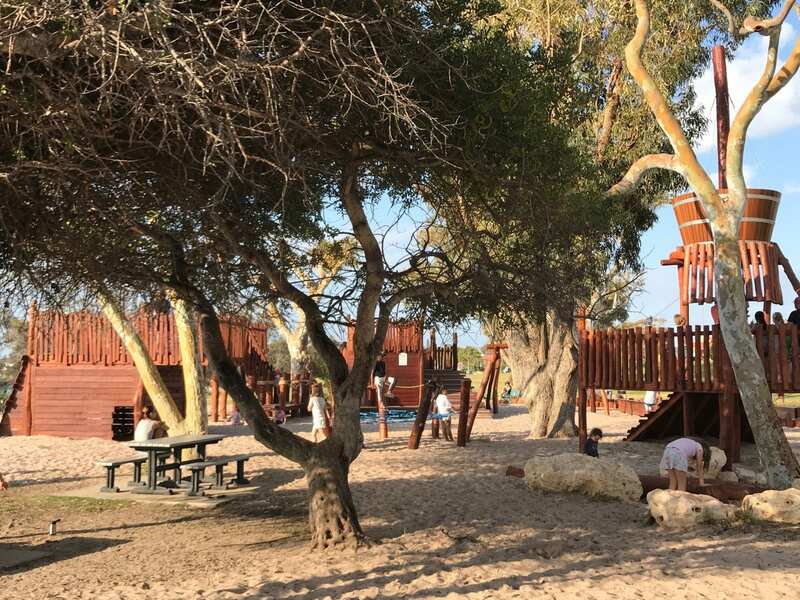 Kalbarri Nature Playground overlooks the beautiful Murchison River on the Kalbarri Foreshore overshadowed by mature trees. 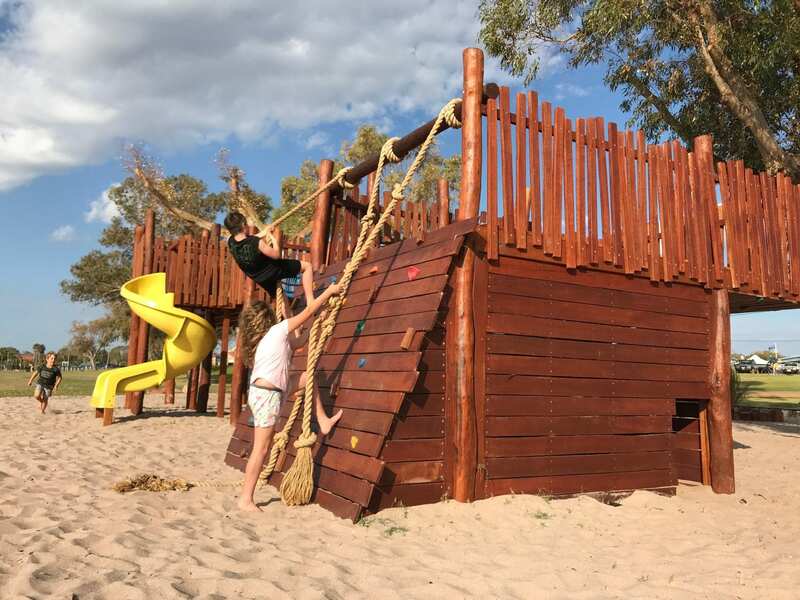 The playground is a much needed addition to the town of Kalbarri which comes to life during the school holidays and is a firm favourite for many families. 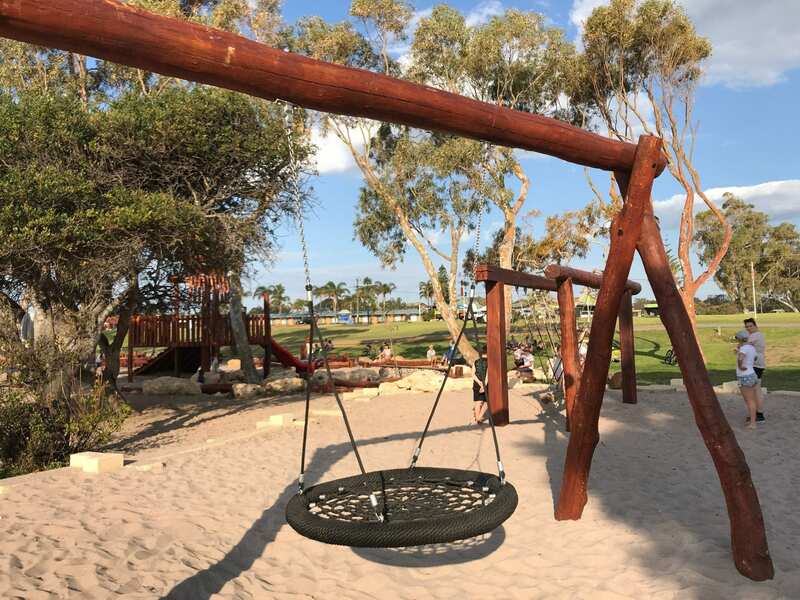 Situated right on the main foreshore in Kalbarri and surrounded by cafe’s, restaurants and the local pub makes it a daily visit. There’s a cycle path along the foreshore so make sure you take your bikes to cycle to and from the playground. 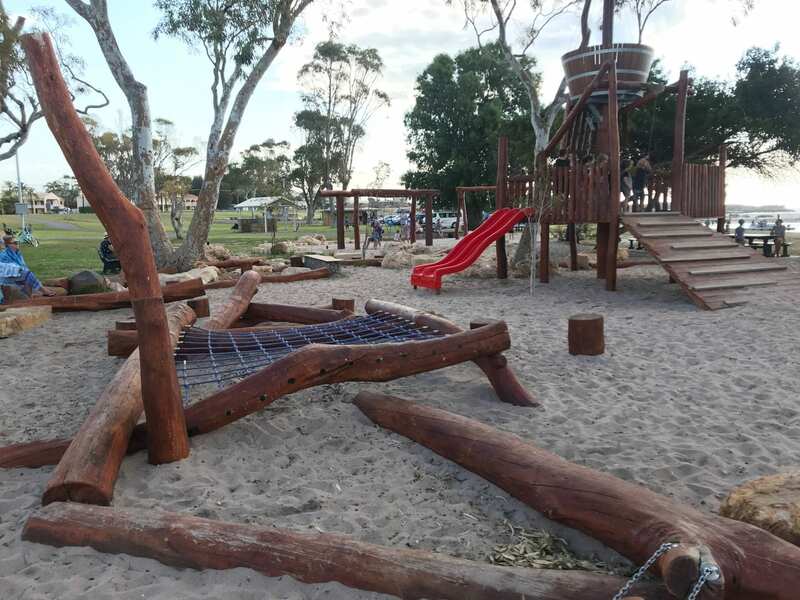 The Kalbarri nature playground is set in sand and surrounded by a huge grassed area complete with picnic tables and benches. 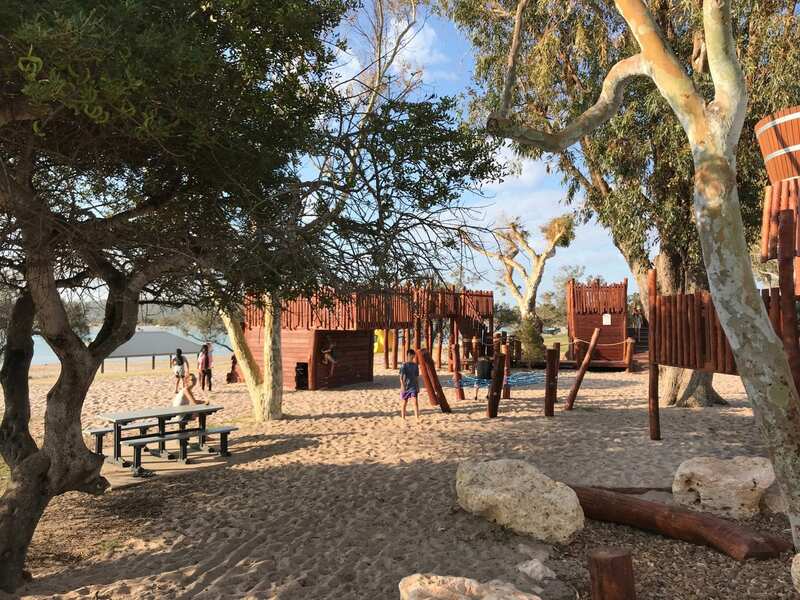 There is a BBQ on this part of the foreshore as well as a toilet and shower block close by. 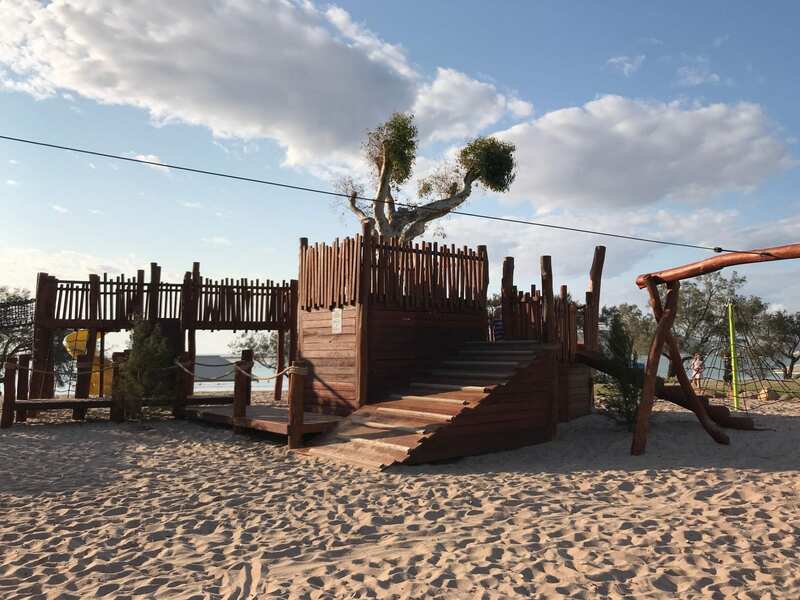 Shade is provided throughout the playground via the mature leafy trees that are interlaced around the equipment. 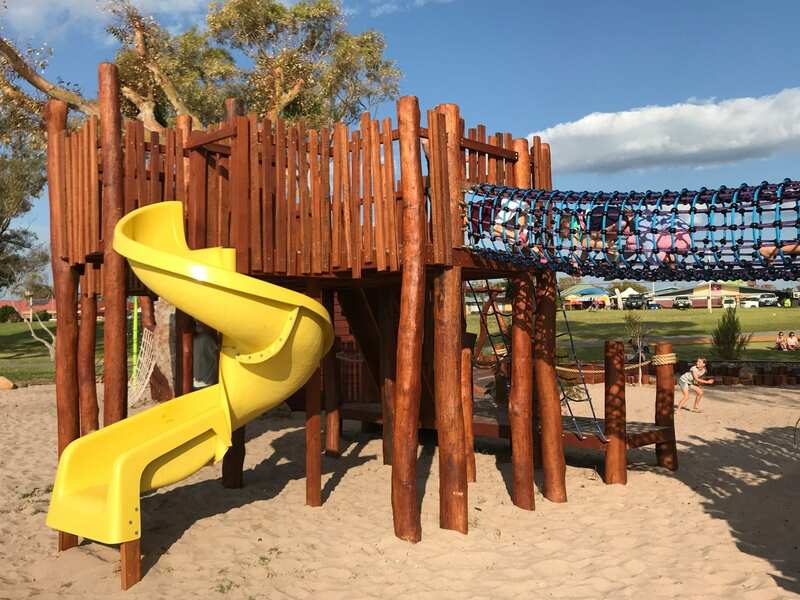 The play equipment includes a wood fortress with look-out birds next and small slide suitable for toddlers. 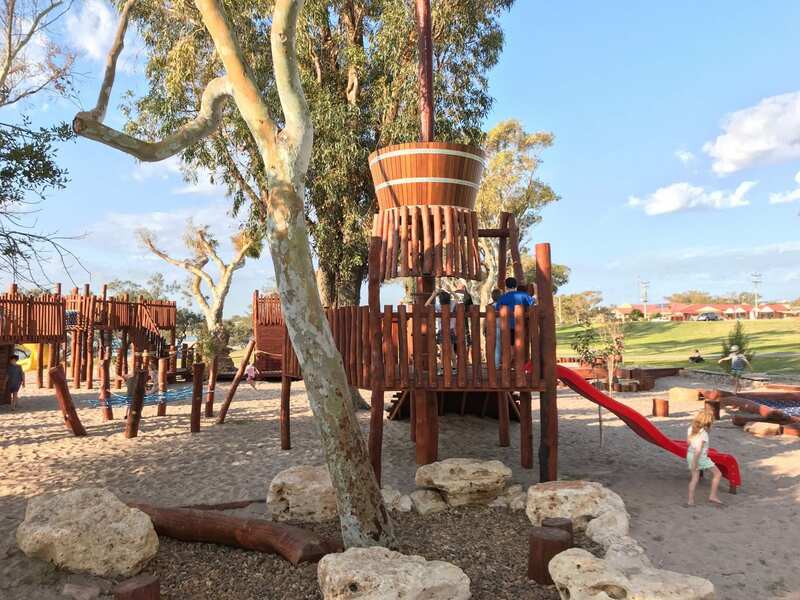 This is also the main platform for the HUGE flying fox which is the main attraction of the Kalbarri Nature Playground. Then there’s a wooden fortress complete with cubby underneath, great for fantasy play and hide and seek. There’s also a bird next swing which is lovely to lie down on and watch the sunset. 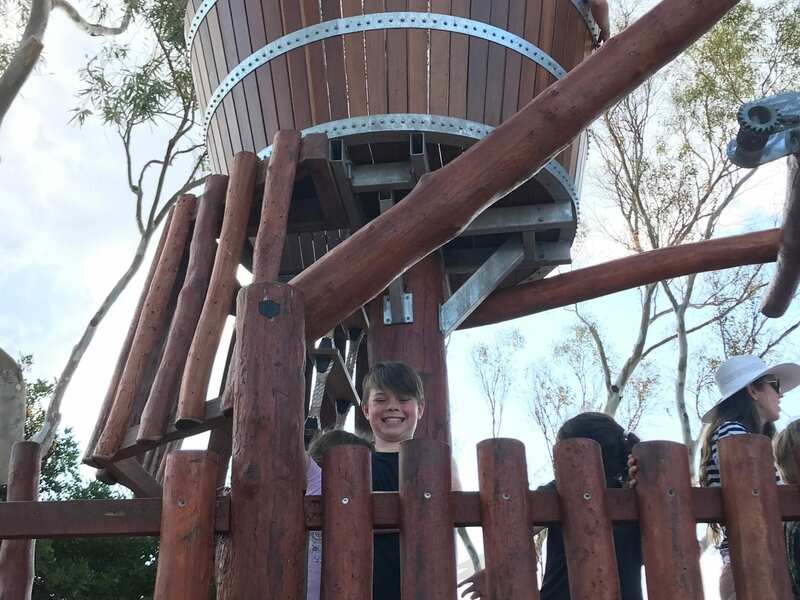 There’s plenty of climbing and balancing equipment for the kids to use, including logs, balancing beams and nets to climb. 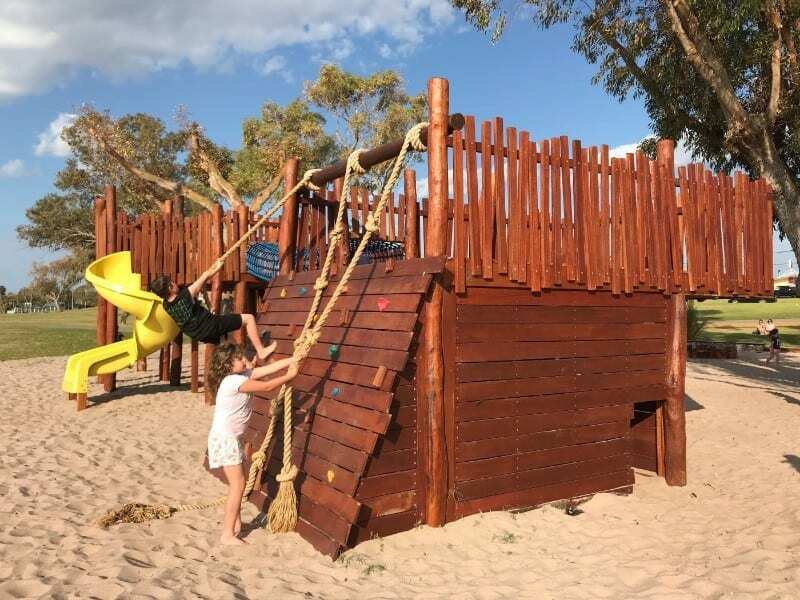 Another play structure includes a fast yellow curly slide from the top of another fortress which links to another fortress via a hanging rope tunnel. 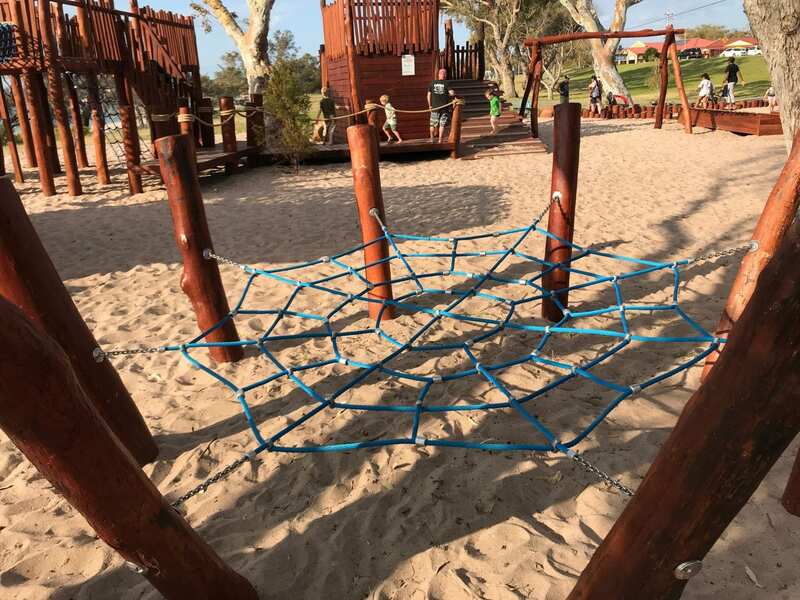 The connecting fortress can be climbed up via knotted ropes and hand and foot holds. 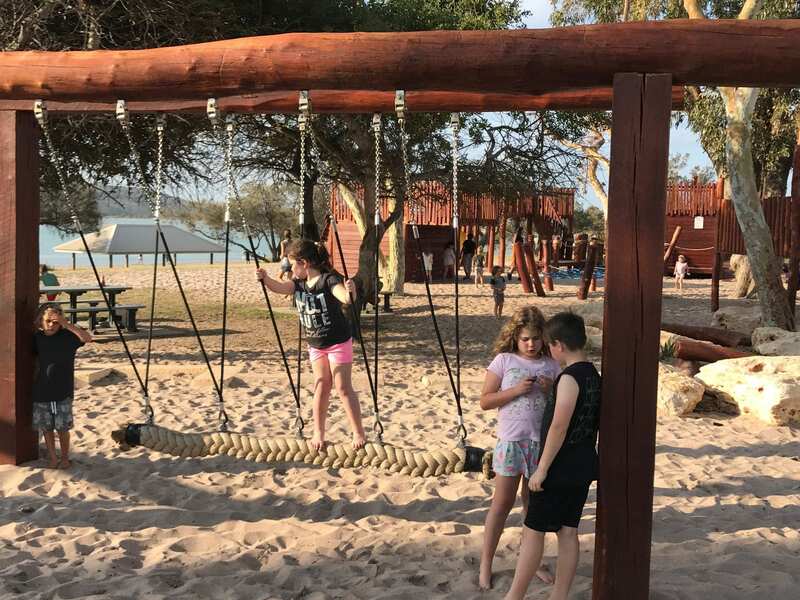 One of the fun pieces of equipment my kids enjoyed was the swinging rope, see how many kids you can get on at once all swinging in the same direction. 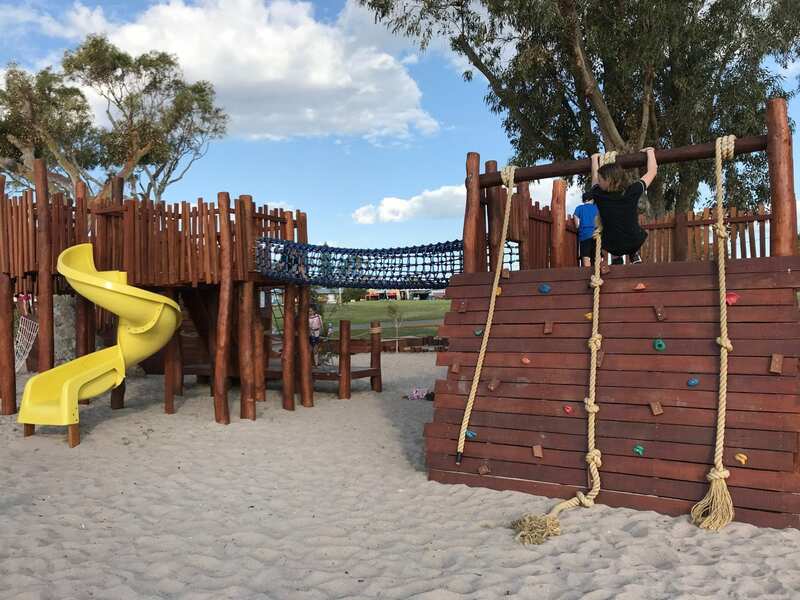 You’ll find balancing beams, rocks, nets and stepping stones throughout the playground adding a nice challenge for the kids to perfect their balancing skills against each other. 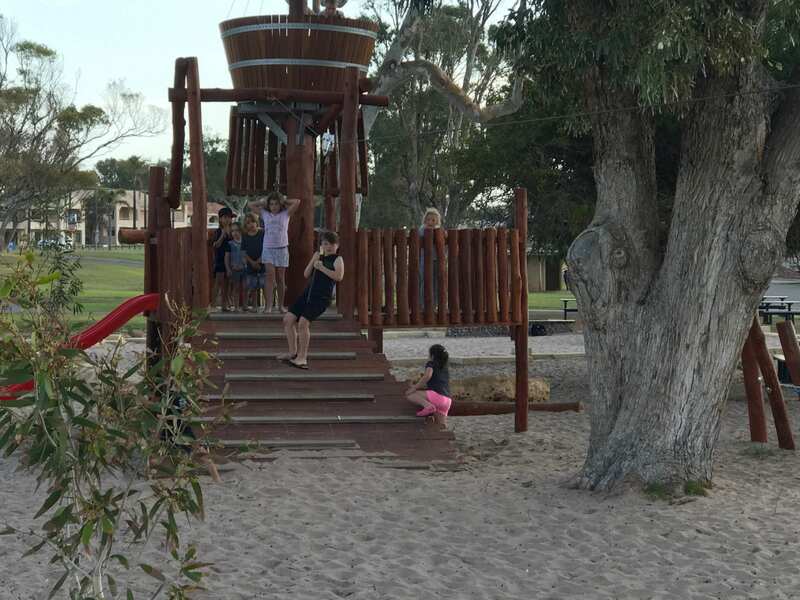 The kids had an amazing time at the new Kalbarri Nature Playground and us parents loved watching the evening sunsets as the kids ran around and enjoyed making new friends. 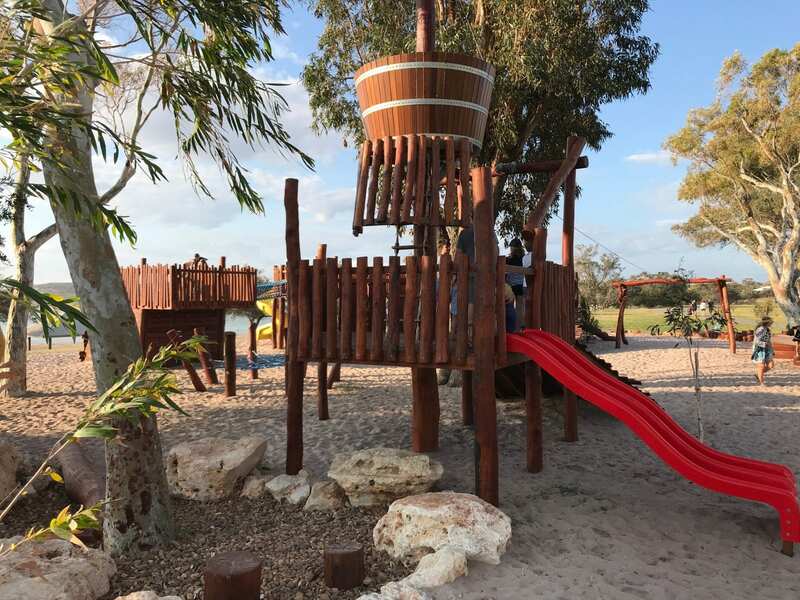 Enjoy your holiday in Kalbarri and let us know what you think of the amazing Kalbarri playground. 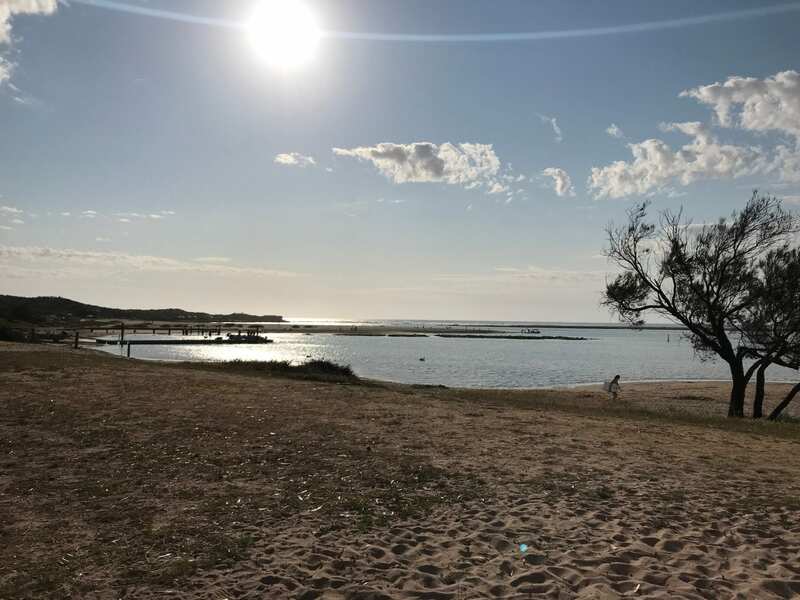 Also check out our Kalbarri Quad Bikes blog, so much fun!